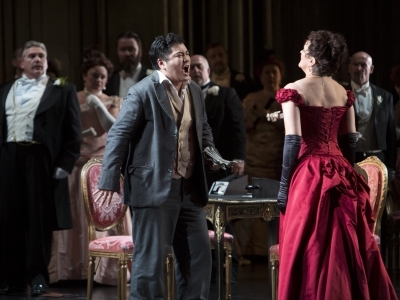 The conflict of duty and thwarted love featuring Verdi’s most evocative music has made La traviata a favourite with opera audiences across the world. Alfredo, has fallen head over heels in love with the courtesan Violetta, but his father Germont disapproves of the fallen woman. Penniless and fearing she will soon die, Violetta agrees to leave Alfredo believing it is in his best interest. 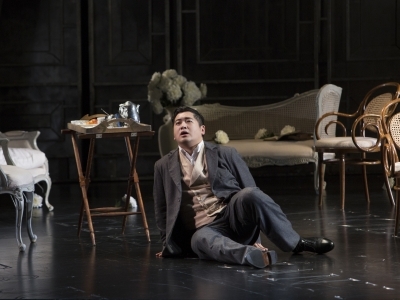 It is only when Germont hears that she is on her deathbed that he realises the error of his ways, and confesses all to Alfredo. But is it too late? Set in 19th Century Paris. 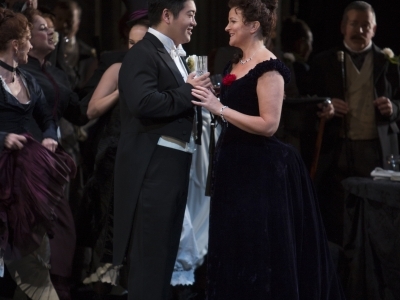 La traviata tops the charts as the most loved and performed opera in the world. Anush Hovhannisyan and Kang Wang both competed in the 2017 BBC Cardiff Singer of the World. La traviata features heavily in the film Pretty Woman. It is the opera that Edward takes Vivian to see and when he drives up in his limo to serenade her at the end of the movie, he plays a piece from the opera at top volume. It's also the inspiration for Baz Luhrmann's Moulin Rouge. Violetta, a courtesan under the protection of Baron Douphol, is giving a party. She is introduced to Alfredo Germont, a young man of solid Provençal family who confesses to being already in love with her. As she leads her guests off to dance, Violetta is overcome by a coughing fit. Her frivolous friends are unconcerned, Alfredo is not. He again protests his love but she discourages him. Left alone when her guests finally depart, Violetta finds herself unexpectedly touched by the young man’s passionate declaration. Despite this she convinces herself that her only choice is to continue to pursue a life of hectic pleasure. Violetta has given in to her feelings and she and Alfredo are now living together in the country, where her health has improved. When he accidentally discovers from her maid, Annina, that Violetta has been selling her possessions in order to pay their bills, Alfredo is overcome with shame and leaves for Paris in order to raise the necessary money. Violetta is surprised by an unheralded visit from Giorgio Germont, Alfredo’s father. Having assumed that his son has been squandering his inheritance on Violetta, he is shocked to discover that she has been paying for everything. He begs her to break away from his son as their relationship is threatening his daughter’s prospects of marriage into a respectable family. Germont persuades Violetta that she must make the sacrifice in order to protect the future happiness of both his son and daughter. A distraught Violetta finally agrees and sends word to Baron Douphol, signalling her return to Paris. When Germont leaves she writes a farewell note to Alfredo, to be given to him when she has gone. Another party is under way. Alfredo arrives alone, expecting to find Violetta back in her old circle. His fears are realised when she appears, on the arm of Baron Douphol. The two men play at cards and Alfredo wins a large amount of money. Desperate to prevent them fighting, Violetta tries to persuade Alfredo to leave the party. He refuses and forces her to say that she loves the Baron. 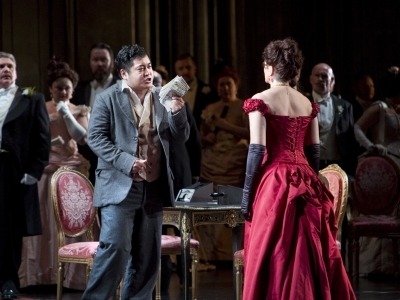 In a fury, Alfredo calls all the guests to witness the repayment of his debts and flings his winnings in Violetta’s face. She collapses. Germont witnesses his son’s outburst and reproaches him for his cruel behaviour. When Alfredo reads the note he rejects his father’s attempts to console him and rushes back to Paris, determined to avenge himself for what he believes to be Violetta’s betrayal. Violetta is dying, friendless and in penury, with only Annina for company. She reads a letter from Germont telling her that he has told Alfredo the truth and that they are both coming to beg her forgiveness. The two lovers are reunited and plan feverishly for a happier future, but it is too late. Violetta dies in Alfredo’s arms.